This entry was posted in American Politics, civil society issues, Democracy, Fareed Zakaria, Governance, Human Rights, Judiciary, Justice, Law and Order, Rule of Law. Bookmark the permalink. History tells us that the The Supreme Court has always been political and apolitical. The late Reed Irvine mentioned in Hugh Turley’s article taped a very revealing phone call between himself and Brett Kavanaugh talking about the car color “problem”. It’s interesting that Reed Irvine mentions the Starr report virtually omits any mention of that “problem”, similar to the 9/11 Commission Report omitting any mention whatsoever of Building 7 – another “problem” for a government narrative (aka whitewash). 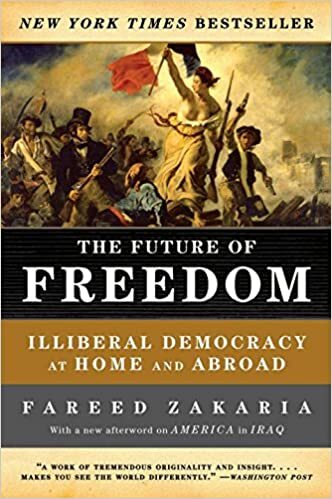 Zakaria has tried to foist democracy onto US political system when the US Constitution contains no single “democracy” word. Then he comes to realize that Americans respect “non”-democratic aspect of American institutions. Why don’t he come to realize his own erroneous understanding of American system being a liberal democracy as the first error all at his own side in the first place? Zakaria, like most leftists, worships democracy god. He is a confused fool, despite his mastery of language. He is so confused that he thinks Fed and military are institutions to be talked about together with judiciary as if US Constitution treats them at the same level. Just yahoo SC and wait for details.